By now, we all must have seen the above picture flashed in every major media outlet all over the world. President designate Obama here is seen hugging Tammy Duckworth at Bronze Soldiers Memorial at Soldier Field, Chicago. She is seen with her husband in the second picture. So who is Major Tammy Duckworth ? Maj Duckworth, a brave daughter of an American father and Thai mother, is a National Guard Volunteer who opted for a tour of duty in Iraq where she got hit by a rocket propelled grenade and lost both her legs and also suffered other permanent injuries. For the uninitiated, the National Guard is a part-time national service voluntary force like our Territorial Army (TA). 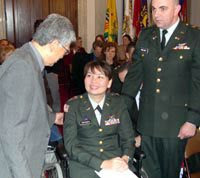 Maj Duckworth, despite her disability is still a National Guard volunteer and has also been appointed as the Director of the Department of Veterans’ Affairs for the State of Illinois. She stands decorated with the Air Medal, Purple Heart and the Army Commendation Medal. The State Departments of Veterans’ Affairs have been in the forefront for veterans’ rights and policies in the US. What is strikingly refreshing is the fact that the State Governments in the US are not rank conscious while appointing heads of veterans’ affairs who are directly answerable to the State Governors and who play a major role in the lives of veterans and also their families. We, on the other hand also have a proactive set up dealing with ex-servicemen (high time we shed this term – it should be gender neutral : either ex-servicemembers or veterans) welfare but the system is so much embroiled in red-tapism, hierarchism and rank-consciousness that the ultimate benefits do not efficiently percolate down to beneficiaries. The system is also lopsided at places and undermines military dignity. To take an example, all over India, DCs / DMs / Collectors of Districts, mostly young IAS officers are appointed Presidents of Zila Sainik Boards ex-officio. Kendriya Sainik Board guidelines however provide that in each district the Vice-President of the Sainik Board should be a retired General Officer. So we ourselves from within the Kendriya Sainik Board (whose Secretary is a serving defence officer) have initiated a hierarchy wherein young bureaucrats are placed as Presidents and retired Generals are placed as Vice-Presidents. Secretaries of Zila Sainik Boards in each district (also variably known as Distt Sainik Welfare Officers) mostly used to be retired Honorary officers or released Commissioned officers of junior ranks earlier. However with our own policy in 1999, the Kendriya Sainik Board directed that such appointments must only be made from amongst retired officers of the rank of Major, Lt Col or Col. As a policy it may seem good but the modality not realized by the powers that be was (/is) that the post of Secy Zila Sainik Board in most states is an appointment under the Junior Time Scale (JTS) equal to a pay and status of a Lieutenant and in this light was it prudent for us in the Kendriya Sainik Board to have initiated an upward revision of ranks without first asking the States to upwardly revise the pay and thereby the status ? Isn’t it self deprecating asking Majors, Lt Cols and Cols to join lower rungs of civil hierarchy ?. Most young IAS officers usually extend due respect to retired military officers but it is not normally the case with officers from other state and provincial cadres. And here I also agree with civilian officers of mixed organizations who say that Army officers are often ready to take up lower level ‘below status’ appointments in MES etc to enjoy cushy stints – this definitely leads to status erosion in the longer run, but that’s my personal opinion of course. Coming back to the Sainik welfare hierarchy. Secretaries of Rajya Sainik Boards (also known as State Directors of Sainik Welfare) are also to be appointed from amongst retired Brigadiers according to Kendriya Sainik Board Policy. It’s another story that most of such appointments were placed in the approx pay scale of a Major of the Army. If indeed an enhanced pay package cannot be provided then a contractual honorarium shall be better than a regular pay scale since it would atleast bypass any comparison with serving civil officers. If retired Brigadiers were to be recommended for such appointments, then firstly the nomenclature of the appointment should have been upgraded to ‘Director General’ and pay scale should have been enhanced. Even the Zila (District) level officers should have been made directly answerable to such State level heads and not civil district heads as is the present practice. Vice-Presidents of Zila Sainik Boards should have been designated as Advisors and not Vice-Presidents who are placed below young civil officers designated as Presidents. The above are small changes in nomenclature which can go a long way in enhancing the dignity of retired officers. But is anyone listening and is someone ready to challenge the status quo ante ? The ideal set-up would be to have an accomplished veteran at the head of the State organization not based on rank but based on his or her achievements, Maj Tammy Duckworth anyone …? “On this Veterans’ Day, let us rededicate ourselves to keep a sacred trust with all who have worn the uniform of the United States of America: that America will serve you as well as you have served your country. As your next Commander-in-Chief, I promise to work every single day to keep that sacred trust with all who have served. May God bless our veterans, and may God bless the United States of America,"
1st Photo Courtesy : Phillyburbs.com, Thank You. 2nd Photo Courtesy : Stripes.com, Thank You. Hope our own Twit learns something from them apart from mortgaging the Nation to US presidents. Bill Clinton: Don't you have female interns in the PMO? MMS: No. But, we have a Cab Secy. proclaiming that Indians love Goerge Bush. Let's learn to love and respect ourselves first. one good piece of news. in mumbai, voters registration for service personnel is going on on fast pace. it is estimated that there are 50,000 votes from the three services and their families. hearing this, shri milind deora (think he's contesting from south mumbai) is having the jitters. considering that the margin between main parties is at best a lakh of votes, atleast in one prominent constituency, we will have the power to decide our MP. Given the current resentment against the present govt, any guesses who'll win or if someone promises to raise the degradation of armed forces in the parliament, then rest be assured he'll win hands down in south mumbai. The babus have finally politicised the last bastion, is it? 2. Legal options. At earliest. In all High Courts simultaneously. Time is running out. Always felt that rather than showing off the Kills and Hauls, we should have given statistics and photos of our wounded and amputees. Nevertheless, today is as good a time as any- Catch hold of guys from your bn. We all get to know the No of US Soldiers who die in Iraq/ Afghanistan. Do they ever state the No of Iraqis and Afghans killed. That is the way to do it. Feels awful to monetise the sacrifices, but the pictures will speak louder to this dumb silent majority and facts are facts. Else Purohit becomes the face of the Army for the vested interests. How I wish this blog could be read by our Supreme Commander. Don't worry, it is being read by the Supreme Commander, so don't you worry. Also being read by the COAS, CNS and CAS, believe me since I am serving in the centre of power. This blog happens to be the only genuine voice concerning the Armed Forces with proper balanced views with zero rhetoric and full logic. taxpayer2 well written and in a very few words. Well, if theyre reading it, perhaps they would care to let us know what will happen next. Dissatisfaction levels in the armed forces have gone through the roof. 1. The degradation of the armed forces has reached an embarassing level. What are you doing about it? When will you tell the government that the new pay structure was only provisionally accepted, and you will no longer accept it now? 2. The degradation of things which are free, like uniforms, discipline, and standards of behaviour is even more alarming. What are you doing, General Kapoor? What answer do you give to a CO who is too scared to give an adverse comment to an officer who is slovenly dressed, lest he complain against him? 3. What are you doing in the Purohit case? Why are you not assuring the public, that if guilty, he will be punished, but only IF. Why are you not ensuring that he is treated properly in custody. Want to give a couple of police inspectors the feel of power that comes from thrashing a serving colonel? "Well, if theyre reading it, perhaps they would care to let us know what will happen next. Dissatisfaction levels in the armed forces have gone through the roof. 3. What are you doing in the Purohit case? Why are you not assuring the public, that if guilty, he will be punished, but only IF. Why are you not ensuring that he is treated properly in custody. Want to give a couple of police inspectors the feel of power that comes from thrashing a serving colonel?" our chiefs should do something so as to ensure justice to the forces/soldier they command. Rumours/mis information etc is demoralizing the soldier at fields. Take fast steps lest everybody should repent later on. our Yes, all the three chiefs should not now keep quit. Morale & trust of 1.5 millions people depend on them. Justice delayed is justice denied. The delay is creating lot of tension, stress etc for everyone in the armed forces including the families. It is neither good for the forces nor for the country. So at least for the country sake, chiefs should stick to their guns, avoid any compromise but ensure action at the earliest. To make the voices of serving and retired armed forces personnel heard, an ex-serviceman today filed his nomination papers from Delhi Cantonment assembly segment where a sizable population of soldiers and their families live. "We have fielded retired Major I S Jakhar from Delhi Cant as we too want to have a major say in welfare policies. Too much injustice has been done to the army on all fronts," retired Major General Satbir Singh said. Jakhar represents Rashtriya Raksha Dal, a national registered party, Singh said and pointed out that the Delhi Cantonment seat has been chosen as a former soldier would consolidate the votes of serving personnel and their families. There are over 30,000 army votes in the assembly seats which the party hopes to corner in its favour. The party plans to raise issues like demand for immediate constitution of an ex-servicemen commission and rectification of "anomalies" in the Sixth Pay Commission with respect to the armed forces. "We would also ensure that postal ballots cast by the soldiers reach the election office," Singh said. The esprit de corps of the army is already broken. All I see is a bunch of chaps who are acting the part which their rank demands of them. They are not made of the real stuff which is required of them. In the end, theyre only in it for themselves, and there is no spirit of sacrifice. Only mouthing empty inanities. There is a complaint that the ATS has subjected Col Purohit to beating and has broken a bone in hand. Come on, he is a recepient of a Wound Medal,( That is seen on his uniform on TV) so he must have served with some distinction. If he is proven guilty, then he deserves the worst, but that should be for later, shouldn't it? When routine matters like pay and equivalence despite unambiguous facts are not being attended to by the highest in the Country how does one expect any grace from the political and bureaucratic class in this Country. I feel utterly helpless like an unguided missile. When are brothers die (lucky bastards) the high and mighty of this country, are always surprised but marvel at our brothers' incredible stupidity. They don't mind throwing scraps and freebies in our cages but don't even begin to believe you can ask for parity in life as in death. I may surprise myself with such abject cynicism but does this country deserve its Forces? We certainly don't deserve this humiliation. The contents of the GoI letter of 2000 (which Nath was referring to) with regard to Rank Pay were scrutinised during the meeting. It emerged that the contents of the letter were "entirely in consonance" with what the Chiefs were saying. The 2000 letter says "Rank Pay will be taken into account for determining their entitlements to such of those financial benefits, concessions, etc, including retirement benefits as are directly related to the basic pay or their pay scales." This is all bunkum..as if the MoD does not know it. Rank pay was Carved out of the Basic Pay as differentiating factor of rank to be added to to the basic pay... There CAT judgements on the subject affirming Rank Pay to be part of Basic Pay.. The bureacracy and the Party also has taken path of Politicisation of the forces, through massive political campaign being conducted via Bombay ATS and paid Media where people from Army and IAF have been found and search for the Neval guy is on...People have been declared guilty by ATS-Media combine and Armed forces maligned.. If it is true, then what stops armed forces to collect,verify and publish the dirt on them. I am sure it will be available in plenty and that too the juicy one, including on medea personals. SAM, DAM, DAND, BHED as universally taught as a basic lesson to any ruler and the warrior must be applied. Remmember, war is raged not only against a soldier but against the safety and security of the country by demoralising the armed forces. In the process many disgrunteled souls have been germinated and also the environment of mistrust between the armed forces and the rulers (including bureaucrats, as they are the real ruler, many may disagree) has already been sowed. The future generation will bear the fruits. Either GOD may give them the wisdom to migrate to some other better pastures or give them sufficient strength to suffer the agony patiently. Have always found this blog releasing the latest information on anything "new" that happend on the 6CPC front. Just picked up an unsubstantiated rumour today, that PMO has finally cleared the file (containing) recommendations from the GoM. And, while the proposal related to 'anamoly concerning pension of PBOR' has been accepted, but ALL OTHER anamolies have been rejected. With your 'sources', will it be possible for you to confirm the same. It was just by chance that I happened to start reading "Mangal Pandey - the true story of an Indian Rvolutionary",by Amaresh Mishra,Rupa and Co,Rs 95/-.It gave me a sense of dejavu and sent shivers down my spine.The conditions created today (esp Pg 70-81)are exactly the same as in 1857 and the rot had started sometime in 1824-1825. I just hope something similar does'nt happen! I would just request a few poeple to read it and if possible present a copy to the chiefs and to the PM,Def Minister,Foreign Minister and Ms Sushma Nath ( I am quite sure that she can read -before it becomes as big as a writing on the wall). Its a small book- about 95 pages ,and somehow it captures the sense of helplessness, anger, frustation and hatred that the officers across the entire spectrum are feeling.I hope they reach a decision soon and the issue doesnt hang fire for long. The armed forces have a duty to protect the nation and to prevent it from disintegration.If the babus are tying it, they should buy it! CEOs TO CUT DOWN THEIR SALARIES?..To top it all NO PB-4 for LT COLs !!!!!!!!!!!!!!!!!!!!!!!!!!!!!!!!!! A Great Great Article. An Eye-Opener. Although majority of the commenters seem to stick to the article, but started digressing gradually, but for the larger good. I doubt how many of the commenters are our Civilian friends. it is a fact that the country is governed/administered by Bureaucrats, and not the Politicians. Politicians come and go.half the time they spend away from their office.none of them is bothered about our Nation.we all have to set these things right.How?.. Why is it that The Police AND BABUS DO NOT HAVE RESPONSIBILITY AND THE ACCOUNTABILITY LIKE THE ARMED FORCES? A CORPS CDR GETS SACKED FOR FAILURE RESULTING OP VIJAY, HOME MINISTER GETS CRITICISED FOR FAILURE DURING DELHI BLASTS BUT NO COMMENTS FROM ANYONE FOR A WRONG REPORT BY THE HOME SECRETARY FOR A WRONG INFO FED TO THE HOME MINISTER THAT A CYLINDER BURST TOOK PLACE.